Waiting for him to wake up! So cute Jude. Smashing photograph! Thanks Adrian. They are very cute animals. Ooooh, what a cutie. We don’t see many, because they are difficult to spot high up. It is always very special when you do see one in the wild. I was hoping for some movement but he didn’t oblige. Thinking hard about his next meal perhaps? 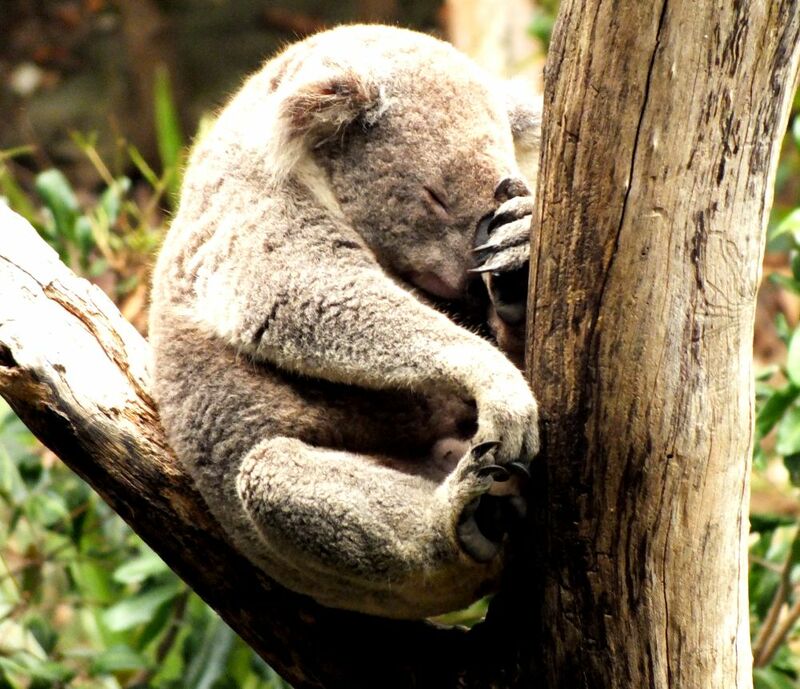 Koalas are so cute. I don’t know anyone who doesn’t find them adorable. Try having one attempting to break into your tent at night. Or listening to their vocalisations endlessly. They sound like rheumy old men!!! I don’t think I have ever heard one. Cuteness overload – so gorgeous! I’d hazard a guess he knows he’s about to be found out for an earlier mistake. Haha… yes he does look somewhat embarrassed. This is such an adorable photo! Where? I’m envious. My attempts to photograph have resulted in a tiny unrecognisable blob. I think this one was at Taronga zoo, Sydney. I have got some in the wild, but pre digital. Seriously cute! We got up close with koalas at Healesville Sanctuary near Melbourne, and I seem to remember they looked pretty underwhelmed by the experience. Guess we were lucky to catch them between naps. I got one climbing down a tree along the Great Ocean Road, but most of the ones I have seen have been up in the fork of a tree and difficult to photograph. Before I read your words, I looked at the picture and thought he looked as though he was fed up waiting for you to take the photo! 🙂 Great picture.